Figure 1: Plot of fluorescence discrimination between wild type and mdx strains using two distinct wavelengths, HEX (535 nm) and FAM (494 nm). Genotyping of an animal is the most accurate way of determining the strain of that specific animal. Various methods have been published over the years in order to discriminate between C57BL/10ScSn-Dmdmdx/J (mdx) and C57BL/10ScSn (wild type). As the mutation in the mdx mice is only a single nucleotide polymorphism (SNP), the method used to detect such a change has to be precise. Traditional approaches have been allele-specific oligonucleotide hybridization, restriction enzyme digestion of the PCR products, snap-back single-strand conformation polymorphism and primer competition PCR, to name a few. At AGADA, we perform genotyping of the mdx and wild type mice via allelic discrimination (SNP genotyping) by combining PCR and mutation detection within a single step using either ear notch, tail snip or cryosections of tissues. The method is based on using two different Taqman probes, one for each allele. 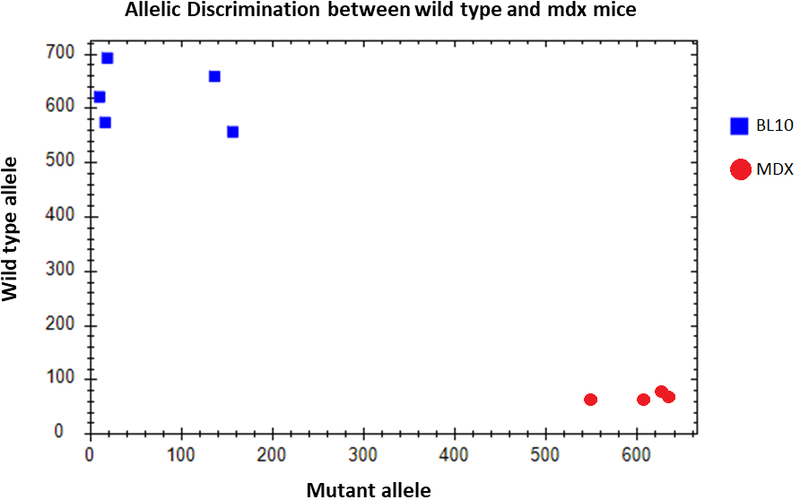 It is simple and can accurately discriminate between the mdx and wild type strain for both male (hemizygous) and female (homozygous) mice.